This pineapple-orange turkey breast recipe is all about flavor and convenience. 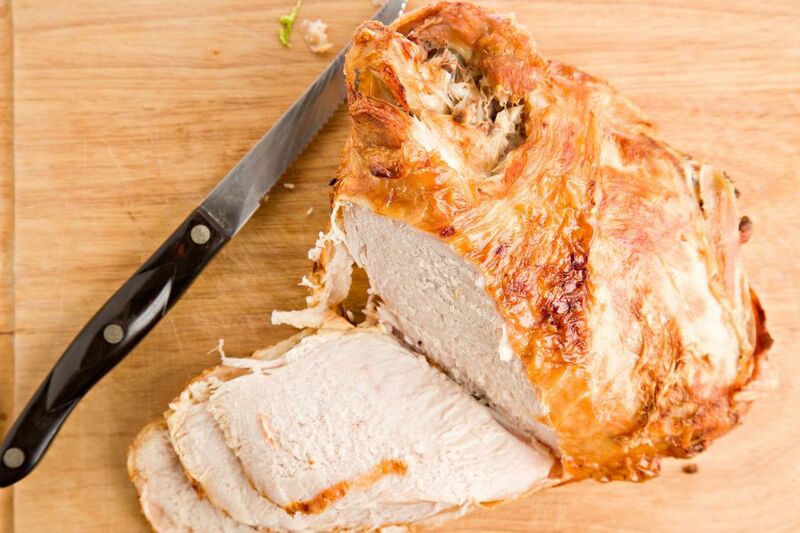 Using frozen, bone-in turkey breasts you get the convenience of frozen poultry with the moist flavor that boneless, skinless turkey breast options lack. The turkey breast is roasted in a foil pouch for seriously easy clean up. The sweet citrus sauce is also a breeze to make. Using orange juice and canned mandarin oranges, you can get a thick flavorful sauce to glaze the turkey immediately before serving or at the table. This will be a turkey breast recipe to keep on hand. Gather the ingredients and preheat oven to 450 F.
Rinse turkey breast and pat dry with paper towels. Sprinkle lightly with salt and pepper. Place turkey breast lengthwise in center of sheet of heavy-duty aluminum foil. Close foil loosely by overlapping ends, turning up short sides to hold in juices. Do not seal airtight. Place foil-wrapped turkey in roasting pan at least 2-inches deep. Insert meat thermometer through foil into thickest portion of breast, being sure not to touch the bone (doing so would throw off the temperature reading). Roast turkey breast in oven for 45 minutes. After first 45 minutes, open and turn back foil. Continue roasting 30 to 45 minutes or until meat thermometer registers 170 F and turkey is nicely browned. Remove from oven and let turkey breast stand, loosely covered with foil for 10 minutes before carving. Meanwhile, begin the sauce by stirring together the pineapple-orange juice, lemon juice, cornstarch, brown sugar, and ginger in a 4-cup microwave-safe measuring cup or medium microwave-safe bowl. Microwave mixture, uncovered, on high power for 3 to 5 minutes until thickened and bubbly, stirring after every minute. Remove sauce from microwave (using an oven mitt as the bowl may be extremely hot). Stir in the orange sections and allow sauce to stand for 1 minute. Serve the turkey breast with the sauce. If you prefer not to use the microwave, you can easily pull together the pineapple orange sauce on the stove. Simply stir together the pineapple-orange juice, lemon juice, cornstarch, brown sugar, and ginger in a medium saucepan over medium-low to medium heat. Cook and stir until thickened and bubbly being sure not to burn the sauce. Cook and stir 2 minutes more. Stir in orange sections; heat through.